Dec 7, 2018; Cleveland, OH, USA; Cleveland Cavaliers guard Collin Sexton (2) drives to the basket between Sacramento Kings guard De'Aaron Fox (5) and forward Marvin Bagley III (35) during the second half at Quicken Loans Arena. Jordan Clarkson scored 26 points for Cleveland, and rookie point guard Collin Sexton had 23. 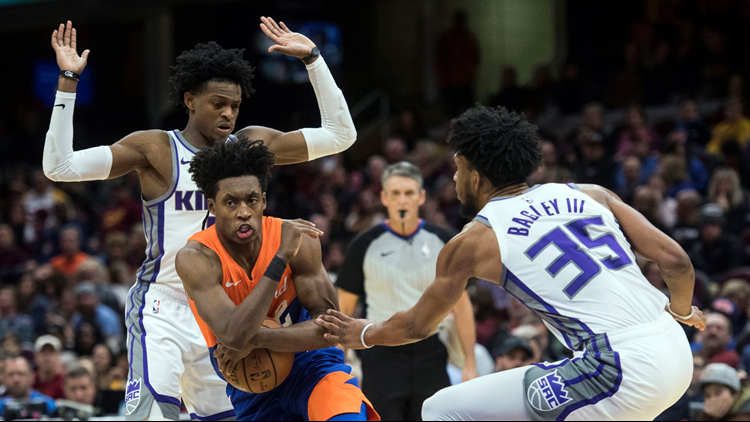 CLEVELAND (AP) - De'Aaron Fox had 30 points and 12 assists, and the Sacramento Kings beat the Cleveland Cavaliers 129-110 on Friday night. Following the game, the Cavaliers confirmed that they have acquired guard Matthew Dellavedova and forward/center John Henson as part of a three-team trade with the Milwaukee Bucks and Washington Wizards. The Cavs will also receive Milwaukee's 2021 first and second round picks, plus Washington's second round pick. In return, the Cavs sent veteran guard George Hill and a 2021 second round pick to the Bucks, while forward Sam Dekker goes to the Wizards. Milwaukee also receives forward Jason Smith from Washington. Cleveland became more short-handed when guard Rodney Hood injured his right foot and didn't play in the second half. Sacramento came out with a hot first quarter for the second straight game. Cavaliers coach Larry Drew used a timeout 86 seconds into the game after the Kings hit their first three shots and led 7-2. Sacramento made 17 of 26 shots in the period. Kings: Bogdan Bogdanovic scored 15 points, and Nemanja Bjelica had 13. ... G Iman Shumpert spent four seasons with the Cavaliers, including their 2016 NBA championship year. He scored six points in 23 minutes. "Shump gives you a guy to put on somebody (defensively), and he fights like crazy and leads with his attitude on and off the court," Sacramento coach Dave Joerger said.